Ska Pioneer, Justin Hinds, passed away on March 16, 2005, just weeks after being diagnosed with lung cancer. He was 62 years young. 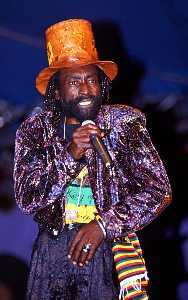 The news of his death was a shock to reggae fans and artists worldwide that have long supported him and have been influenced by his music. Born and raised in Steertown, in the parish of St. Ann, Justin’s musical career took off when he teamed with Dennis Sinclair and Junior Dixon to form Justin Hinds and the Dominoes. He was often quoted as saying his love for Fats Domino, as well as the game of dominoes, influenced the name of his group. In addition to Fats Domino, he was also a fan of American artists such as Professor Longhair, B.B. King and Louis Jordan. The following three decades were also prolific times for Justin. In the mid-70’s, Justin collaborated with producer Jack Ruby and released two well received albums, “Jezebel” and “Justin Time.” The 1980’s brought the release “Travel With Love,” produced by Nighthawk Records and was recorded at the Tuff Gong studio. The unique album “Wingless Angels” was released in 1998. This body of work was the result of collaboration with his long-time friend Keith Richards of the Rolling Stones and records the haunting and deep rhythm of nyabinghi drumming and chanting. While Justin Hinds has passed on, his influence on reggae will always be kept alive. Today’s artists, and greats such as Bob Marley, were influenced by his pioneering work in ska and rocksteady. If people are remembered by the good they do in their lives, Justin Hinds will live on through all time, bringing love and joy through his music for generations to come.